The United Kingdom’s Department of Energy and Climate Change’s (DECC) Energy Trends includes statistical information on energy as a whole and by individual fuels, presented chiefly in charts and tables. 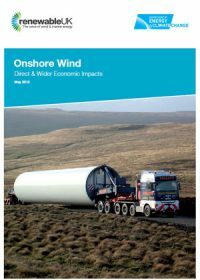 This edition covers the fourth quarter of 2013, and also 2013 as a whole - providing a comprehensive picture of energy production and use in the UK. Low carbon electricity’s share of generation increased from 31 per cent in 2012 to 35 per cent in 2013, due to higher renewables and nuclear generation. Of electricity generated in 2013, coal accounted for 36 per cent (a fall of 3 percentage points on 2012) and gas 27 per cent (a fall of 1 percentage point on 2012), gas’ lowest share since 1996, due to high gas prices. Nuclear’s share increased by less than 1 percentage point on 2012 to 20 per cent of the total. Renewables’ share of generation increased by 4 percentage points on 2012 to a record 15 per cent. 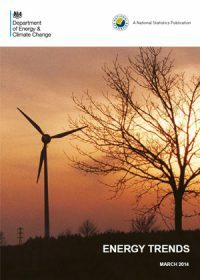 Renewable electricity generation was 52.8 TWh in 2013, an increase of 28 per cent on the 41.3 TWh in 2012, with wind generation up 40 per cent. Renewable electricity capacity was 19.4 GW at the end of 2013, a 25 per cent increase (3.9 GW) on a year earlier. Provisional estimates show that carbon dioxide emissions fell between 2012 and 2013; the key factor driving the change was a switch in electricity generation away from fossil fuels. 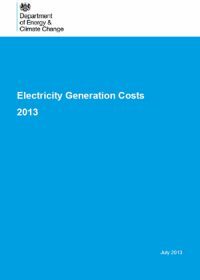 Electricity generation costs are a fundamental part of energy market analysis, and a good understanding of these costs is important when analysing and designing policy. 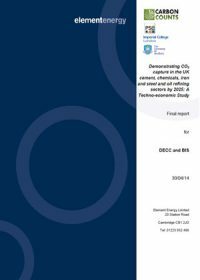 The United Kingdom’s Department of Energy and Climate Change regularly updates estimates of the costs and technical specifications for different generation technologies used in its analysis. Cost data is broken down into detailed expenditure per MW capacity or MWh generation for the full lifetime of a plant including planning costs, construction costs, operating costs and eventual decommissioning costs. 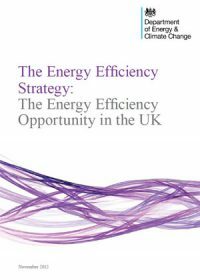 The Energy Efficiency strategy sets the direction for energy efficiency policy for the coming decades in the United Kingdom. This strategy describes the UK government’s ambition, the barriers they need to address, and the additional steps they are taking to stimulate the energy efficiency market. It shows how the government will act to connect finance with demand, encourage innovation, and make energy efficiency information more accessible to the consumer. Presentation on CCS in the UK during A Year of Knowledge Sharing: Sowing the first seeds, Rotterdam, the Netherlands. In July 2010, the Government published its 2050 Pathways Analysis work. 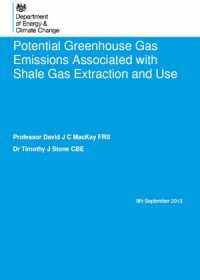 The analysis explored a range of potential pathways, choices and trade-offs for achieving long-term greenhouse gas emissions reduction target and ensuring the UK’s energy needs are met. 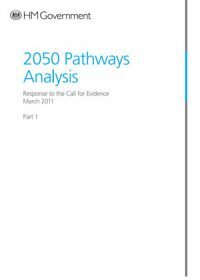 The 2050 Pathways Analysis was published as a Call for Evidence, running from 27th July to 5th October 2010. The questions on which evidence was sought are set out in Annex A. 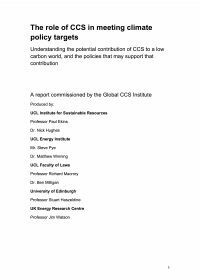 The United Kingdom’s Department of Energy and Climate Change (DECC) published the analysis as a Call for Evidence in order to test with a wider range of experts and stakeholders whether the assumptions and data underpinning the model were considered to be sound and based on the best available evidence. The response to the Call for Evidence was very positive. The overwhelming opinion was that the 2050 Pathways Analysis was a valuable tool and a useful contribution to the debate about the United Kingdom’s energy future. 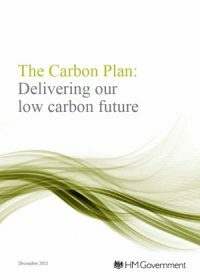 This report sets out how DECC revised the model, and the evidence and assumptions that underlie the changes they made (see Part 2A).